It’s my last post of the year, so before I continue with a visual recap of our holiday shenanigans, I hope you all have a fun and safe time ringing in the New Year this coming weekend. However you may feel about 2016, each day is a chance to turn things around. Maybe you want to start right now or perhaps it helps you mentally to start on the first day of 2017 or after a week of getting familiar with writing or typing 2017 instead of 2016. Whatever works for you! Just promise me you won’t go into the new year already defeated. It might be exercise, better eating habits, volunteer work, activism, professional goals, learning something new, getting organized, finances, taking care of things you’ve been putting off, reconnecting with someone, spending more quality time with people. Many of the more challenging objectives in life require baby steps, patience, and perseverance. So be patient with yourself. Be kind to yourself. You will get there. 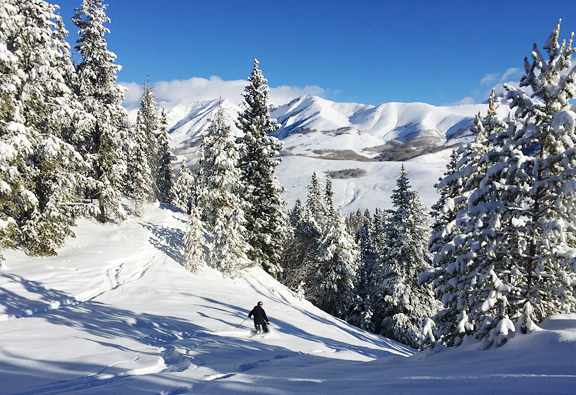 It’s been a wonderfully snowy week in Crested Butte with sunshine in between powder days, allowing us to rotate through several flavors of skiing. I’m talking quads of steel! 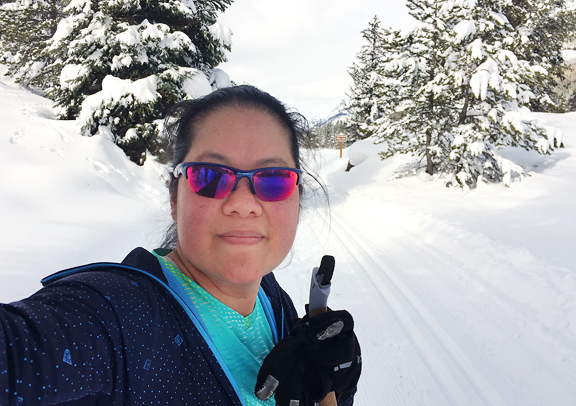 Neva has been enjoying snowy romps around the neighborhood and a few ski tours (we have to ease her back into it because… she’s crazy). When she isn’t losing her marbles in deep snow, our girl likes to curl up on a plush blanket on her bench by the window – watching people and dogs walk by while she soaks up the sunshine, dozing off on occasion. I never said she wasn’t spoiled. 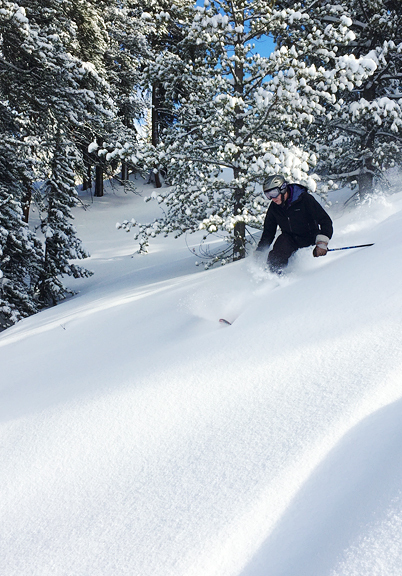 christmas morning on the lift – fresh tracks and free refills! I debated punting on a recipe this week since we are between holidays, but I am also a creature of habit. Besides, I like sharing recipes with folks since I can’t easily make something and serve it to most of you. 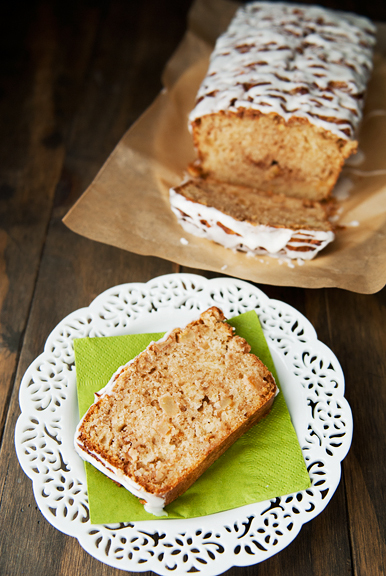 This happens to be the perfect kind of breakfast/brunch/tea/snack/dessert cake for this time of year without involving pumpkin spice, peppermint, or eggnog. Don’t get me wrong, I like all three of those flavors (not together, though), but enough is enough is enough. 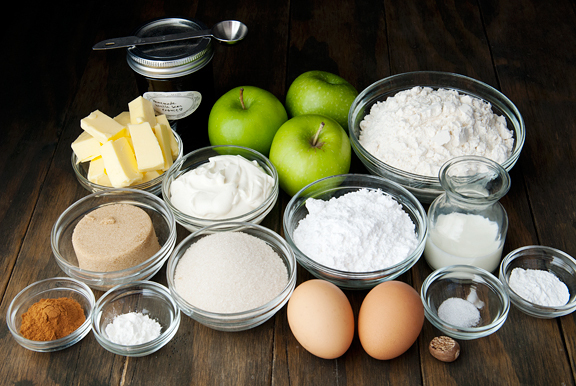 Let’s make some apple fritter bread. 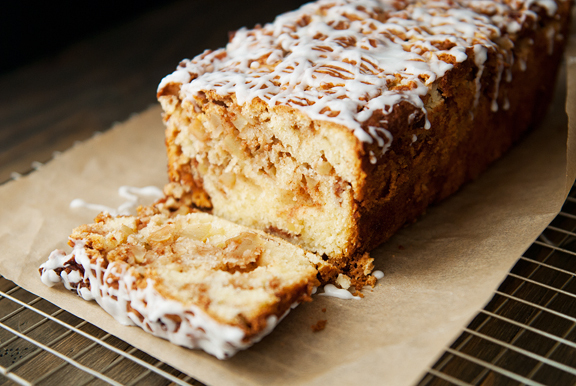 This bread is almost as easy as a quick bread except for the part where you layer the fruit with the batter. The batter tends to be thicker and fluffier than most quick bread batters (I’m thinking banana or zucchini breads). You can probably use any variety of apple, but I prefer the tartness of the Granny Smith for this kind of bread. The original recipe alternates half of the batter with half of the apples, ending with apples on top. 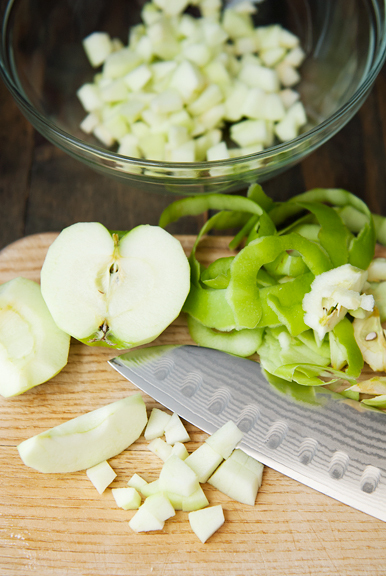 You can use a knife to swirl the apples and batter together. I think I may not have swirled them together enough on my first attempt, because the loaf would fall apart where the apple pieces were concentrated when I sliced it. On my second try, I decided to mix most of the apples into the batter, leaving a quarter of the apples for the topping. The result was a more uniform bread that held together nicely and tasted great, but didn’t look or taste like a fritter as much as the first loaf. So you’ve got options. 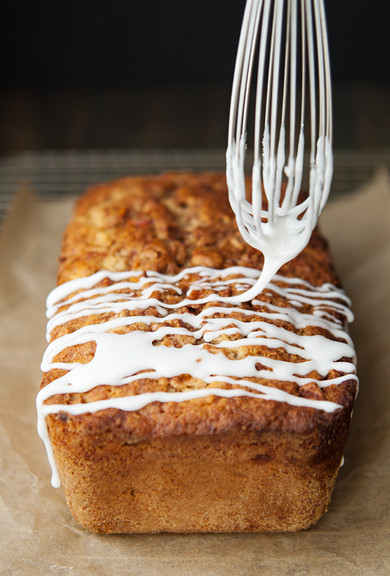 For the glaze, you simply whisk some milk (or water or hello, bourbon!) into the confectioners sugar until you get the consistency you want. Start with a tablespoon of liquid then add more as needed. If it’s too thick, it will fall in big globs. If it’s too thin, it will run off the sides and pool at the bottom of the bread. Also, make sure the loaf is cooled before glazing it, or the heat will cause the glaze to pool together and also run down the sides. You can see in the cross sections how the two loaves are different. 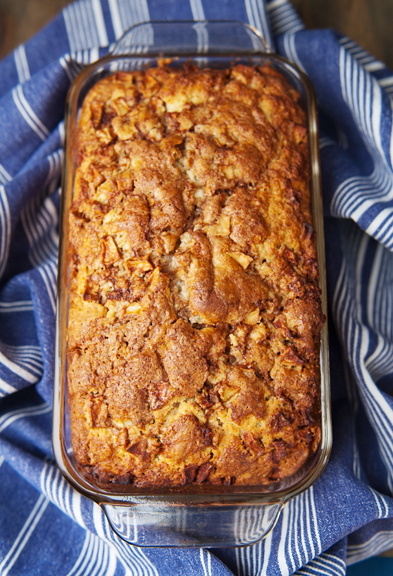 The layered version has discrete pockets of spiced apples whereas the mixed version looks and tastes more like a quick bread. Personally, I like the layered version better both for the aesthetics and the taste, but it can be messier to slice. That said, if you offered me either of these loaves, I’d be delighted to have a slice! Preheat oven to 350°F. Grease and flour a loaf pan (9×5 inches). 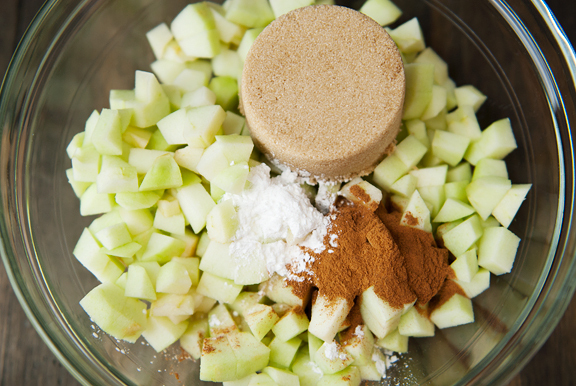 Place the diced apples, brown sugar, cornstarch, and ground cinnamon in a large bowl. Toss together until the apples are coated. Set aside. 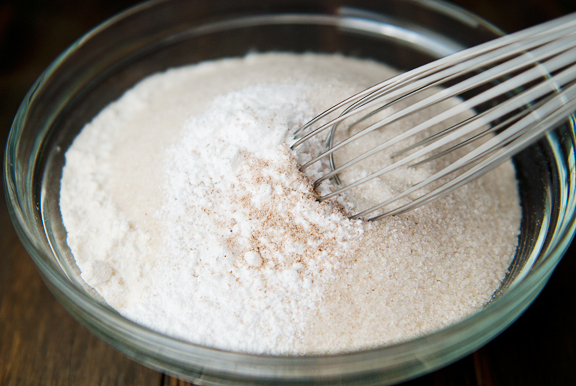 Combine the flour, granulated sugar, baking powder, salt, and ground nutmeg in the bowl of a stand mixer fitted with a paddle attachment. 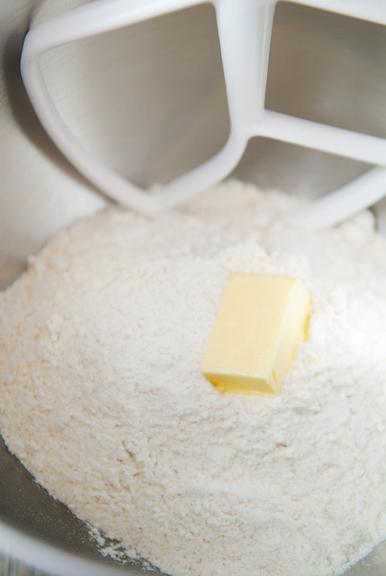 With the mixer on low speed, add the butter a tablespoon at a time until the mixture resembles coarse crumbs (about 2 minutes). 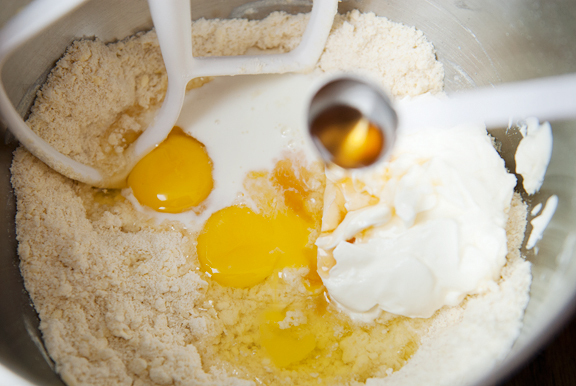 Add the eggs, vanilla, sour cream, and 2 tablespoons of milk and beat on medium-high speed until the batter is light and fluffy (about 1-2 minutes), scraping the sides of the bowl down halfway through. 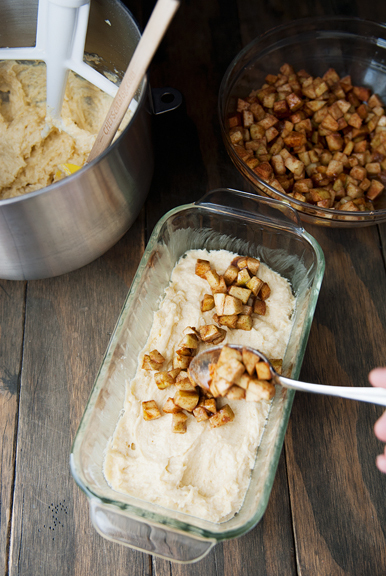 Method #1 – layers: Pour half of the batter in the baking pan, then top with half of the apples. Repeat once more with the remaining batter and apples. Swirl the layers with a knife (make figure eights in the batter with a knife). 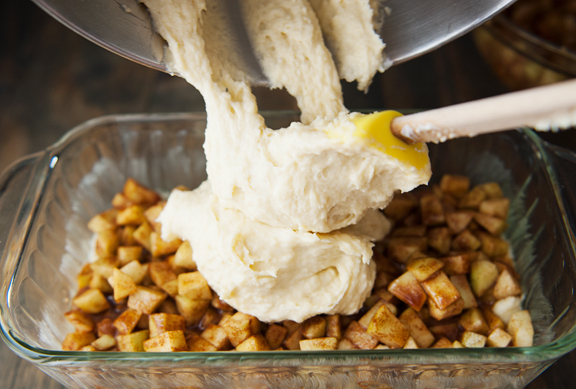 Method #2 – uniform: Mix 3/4 of the apples into the batter. 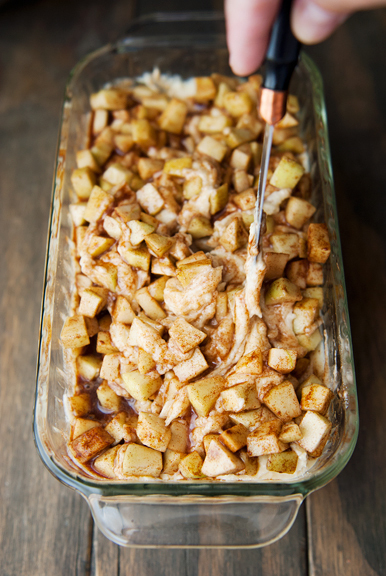 Pour the batter into the baking pan and top with the remaining 1/4 of the diced apple mixture. Bake: Pat everything down and bake for 45-60 minutes (mine took 75 minutes) until the center sets and a toothpick inserted in the middle comes out with a few crumbs, but not wet. Let the bread cool for 30 minutes before carefully removing from the pan. 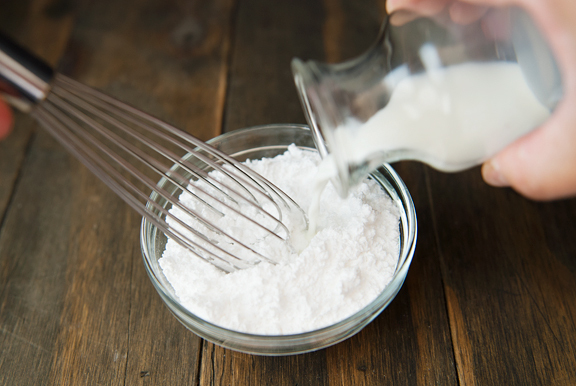 Make the glaze: Whisk the powdered sugar together with a tablespoon of milk. Add more milk as needed to achieve a drizzling consistency. When the bread is cool, drizzle the glaze over the top and let set (about 15 minutes). 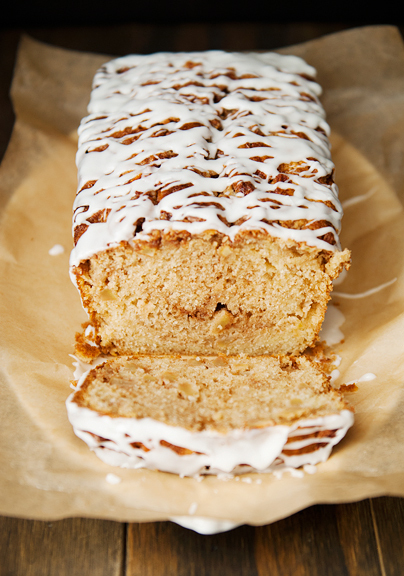 Looks scrummy – anything with vanilla! Thanks for your positive outlook on 2017. My veggie garden was neglected in 2016 so bring on the new year! All the best to you. So glad you decided to share this recipe. It looks delicious. I think I’ll try it today but with the bourbon! 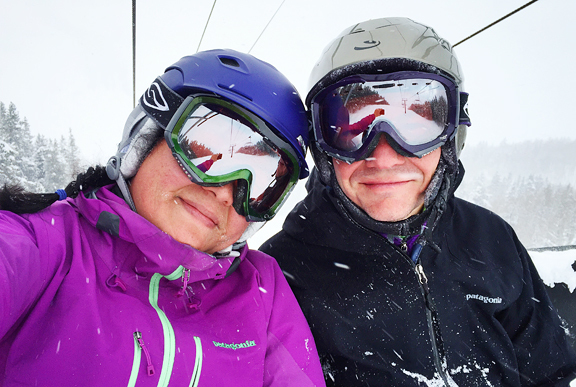 As always I look forward to your blog and can’t wait to see what you have for next year! Yum! My class will love this. Thanks for the positive outlook. I am meeting my trainer today, and am getting stronger for 2017! I so appreciate your uplifting and pragmatic words of encouragement regarding approaching the New Year, Jen. Meanwhile, I’ve a gourmand houseguest from Italy staying with me at the moment and I find myself getting nervous cooking for her. Grazie for this recipe which sounds/looks scrumptious and seems like it would be good any time of day, too! Happy Holidays, Jen! Love, love the picture of Neva. It made me chuckle out loud. 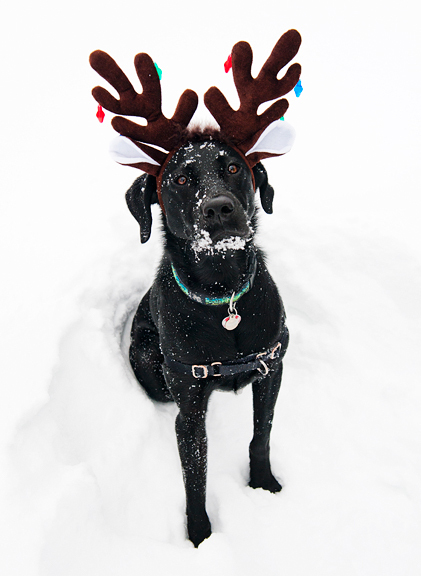 And I will never cease to be amazed how still your pups sit for their special holiday treats. After I see your plates of dog treats, I think of making something similar for our cats, but don’t know what I could fix them. And of course, they would never pose for a picture the way your dogs have done. I’ve finally finished school, so now I have more time to cook and exercise on a regular schedule! Yahoo! I will make this recipe to celebrate but it does feel strange not to have homework. Looks delicious. Love that Neva Pup. Beautiful snowy pics!! 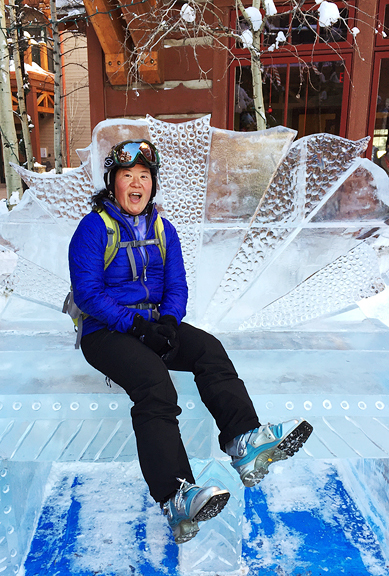 Jen, thanks for another delicious recipe as well as a taste of the good life in Colorado. Happy New Year! I can smell that bread baking it looks so good! Happy New Year, thank you for your amazing blog. And Neva is so hilarious! 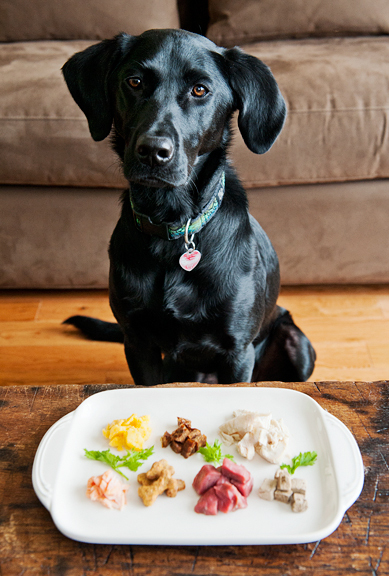 Lucky dog with that goodie plate. What a great post, thanks for the thoughts. And the snow shots, how sweet it is! 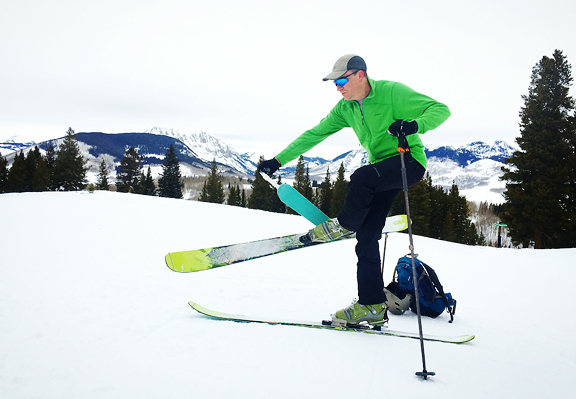 Happy, healthy, new year, you’ve inspired my to give skate skiing a chance in 2017! Happy New Year, Jen & family! Thank you for sharing your recipes and snippets of life with us, it is such a joy to read your blog. Wishing you all good things for 2017! I made this yesterday for my husband, whose favorite breakfast treat is an apple fritter. It was so delicious, even without the glaze. Thanks for the great recipe! MK - Oh my, I would be nervous as well. But I hope she appreciates the efforts you are going to in order to make her feel welcome and comfortable (and well fed!). Happy new year, MK! Pey-Lih - Good for you! Jean Ann - You are so very welcome! And happy new year to you!